Mendocino’s Pacific coast is made up of rocky cliffs, wild headlands, and grassy bluffs broken up by hidden coves and breathtaking beaches, sea stacks and rock arches, and sea caves, punchbowls, and blowholes. All along the coast you’ll find abundant tidepools, vast sand dunes, glass beaches, towering redwood forests, ecological terraces, protected wetlands and coastal estuaries, stunted pygmy forests, miles of hiking, biking, and walking trails. You’ll also be able to visit historic lighthouses, art galleries, museums, bed and breakfasts, restaurants, and wineries, ride a historic train, and tour an African animal preserve. There is definitely no shortage of things to do in and around Point Arena, Mendocino, and Fort Bragg! Pomo Bluffs Park, with stunning views of the Pacific Ocean, covers the 25 acres of land south of Noyo Bay. A paved trail follows the edge of the bluffs to scenic lookout points, interpretive displays, and viewing benches. The Park is located on Todd Point, a great whale watching spot during the gray whale migration from February through April. Noyo Headlands Park sits north of Noyo Harbor atop the rugged bluffs of California’s rocky Pacific coastline. The 92 acre oceanfront park is located on land that was reclaimed from an industrial mill site owned by Georgia-Pacific. The flat, eight foot wide, ADA-accessible, paved Noyo Headlands Fort Bragg Coastal Trail hugs the cliffs, providing awe-inspiring views of the Northern California coastline, scenic lookout points, benches made by local artists, and interpretive displays. Fort Bragg is the largest city between San Francisco and Eureka on the beautiful Mendocino Coast. The city is famous for its Glass Beach, family-friendly tidepooling at MacKerricher State Park, and the 100+ year old Skunk Train. The Guest House Museum, located in the 1892 Victorian Mansion used as Fort Bragg Lumber Company’s guest house, features exhibits on the logging, railroad, and fishing industries, the Pomo Indian Tribe, and the history of Fort Bragg and the Mendocino Coast. Glass Beach is believed to have the highest concentration of sea glass in the world and is one of the most popular tourist destinations on Northern California’s Mendocino Coast. While there is an “official” Glass Beach in Fort Bragg, there are actually three different glass beaches accessible off the Noyo Headlands Fort Bragg Coastal Trail. Built in 1915 as part of the Ten Mile Railroad, Pudding Creek Trestle was originally used to move timber for the Union Lumber Company across Pudding Creek, from Ten Mile River to the mill in Fort Bragg until 1949. Measuring 527 feet long and 44 feet tall, Pudding Creek Trestle was the first of five trestles built for the railroad. Pudding Creek Beach, sitting below the Pudding Creek Trestle at the mouth of Pudding Creek, is a sandy pocket beach with tidepools between the steep cliffs of two coastal headlands in Fort Bragg. 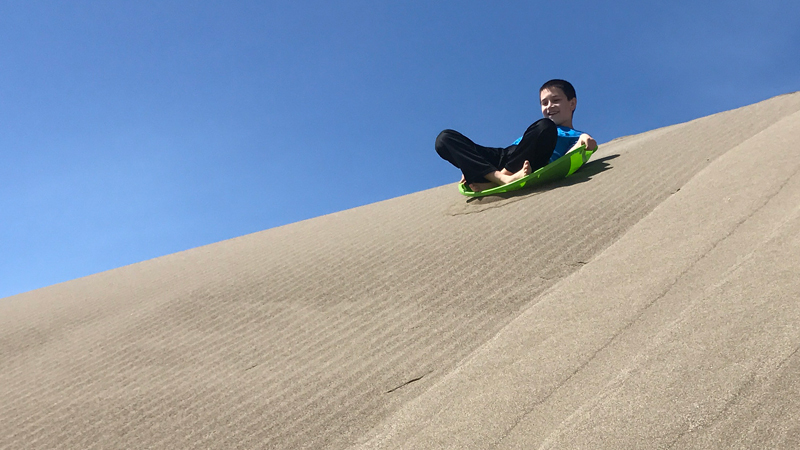 The Mendocino sand dunes are part of the 1,300 acre Inglenook Fen—Ten Mile Dunes Natural Preserve that forms the northern section of MacKerricher State Park and includes Ten Mile Beach, the Inglenook Fen, and the Ten Mile Dunes. The Ten Mile Dunes extend three-quarters of a mile from the beach to Highway 1. With sandy dunes reaching up to 130 feet tall, this is California’s most pristine stretch of coastal dunes. Built as a logging railroad in 1885, the world famous Skunk Train continues to follow the coastal “Redwood Route” as it has for more than 130 years, but instead of transporting lumber company families and workers to the logging camps along the route, the train now carries tourists to the majestic Mendocino redwood forests. Established in 1976, Jug Handle State Natural Reserve is a 776 acre park on the rugged Mendocino coast with spectacular ocean views, a wide sandy beach, picnic areas, lush forests, and a unique ecological staircase. While visiting Jug Handle State Natural Reserve, you can simply relax at the picnic area and enjoy the gorgeous views of the Pacific Ocean, or you can hike down to the sandy Jug Handle Beach, hike the Headlands Loop Trail or hike the Reserve’s famous Ecological Staircase. The 296 acre Point Cabrillo Light Station State Historic Park features a beautifully restored 1909 lighthouse, 11 other historic structures, and hiking trails on a rugged headland 1.5 miles north of Mendocino, California. The Light Station, one of the most complete in the United States, and Point Cabrillo Natural Preserve occupy a spectacular coastal headland and prairie thrusting out into the Pacific Ocean. And, in a cove nearby, lay the remains of the brig Frolic, the most important Gold Rush era shipwreck in California. Russian Gulch State Park includes 7,630 feet of stunning rocky coastal bluffs, a protected beach, tidepools, 15 miles of lush forested hiking trails and horseback riding trails, five miles of bike trails, campgrounds, and shaded picnic areas. The sleepy, Victorian-era, seaside village of Mendocino sits on rocky bluffs along the rugged Northern California Coastline and offers visitors quaint shops, cozy bed and breakfasts, delicious restaurants, art galleries, and absolutely stunning panoramic views of the Pacific Ocean. Mendocino was the first of several north coast towns founded between 1851 and 1920 during the height of the lumber industry. It is designated a National Historic Preservation District with 86 Mendocino Category 1 Buildings easily walkable in the historic downtown. Located in the Big River Unit of Mendocino Headlands State Park, where Big River flows into the Pacific Ocean, driftwood-laden Big River Beach sits just below the south end of the historic village of Mendocino. The white sand beach is part of a nearly 7,400 acre wildlife corridor that includes 1,500 acres of coastal estuary wetlands. The Mendocino Bay Overlook Public Access Easement includes an easy, flat, 0.2 mile out and back trail to a small yet magnificent grassy area atop the bluffs overlooking Mendocino Bay, Big River Beach, Mendocino Headlands State Park, and historic Mendocino Village. This is the spot photographers stand to take postcard-quality photos of the town atop the bluffs. Located at the mouth of Little River, Van Damme State Park, sits across Highway 1 from the Little River Golf Course and offers visitors a gorgeous semi-protected beach, ten miles of hiking trails through lush forest, campgrounds, and a unique Pygmy Forest. Located in the tiny town of Elk, Greenwood State Beach includes a coastal headlands trail with cascading carpets of wildflowers, a shady picnic area, breathtaking views of the sparkling blue Pacific Ocean, and access to a long stretch of beach. Just offshore in Greenwood Cove, sea arches and sea stacks, with names like Wharf Rock, Gunderson Rock, and Casket Rock, rise from the surf. With almost five miles of spectacular California coastline, Manchester State Beach Park has a long stretch of sandy beach, sand dunes, wetlands, and acres upon acres of flat meadow-like grasslands on coastal bluffs. The northernmost segment of California’s 800 mile long San Andreas Fault, separating the Pacific and North American tectonic plates, intersects a portion of Manchester State Beach Park. Located on the majestic southern coast of Mendocino County, the 115 foot Point Arena Lighthouse is the tallest lighthouse on the west coast where visitors can climb the 145 step spiral staircase all the way to the lantern room at the top. The historic Fog Signal building houses a museum displaying the Lighthouse’s original 1908 First Order Fresnel Lens and exhibits about the area’s history. B Bryan Preserve is a 110 acre African Wildlife Conservation Center located in Point Arena, California that houses rare and endangered African animals including Roan, Sable, and Greater Kudu Antelope, as well as Grevy’s Zebra and Hartmann’s Mountain Zebra, and the Rothschild’s Giraffe. They even let you feed the giraffes an get giraffe kisses. Moat Creek Beach, officially called Moat Creek Coastal Access, covers three miles of beautiful beach, bluffs, and two creeks that flow into the ocean — Moat Creek and Ross Creek. 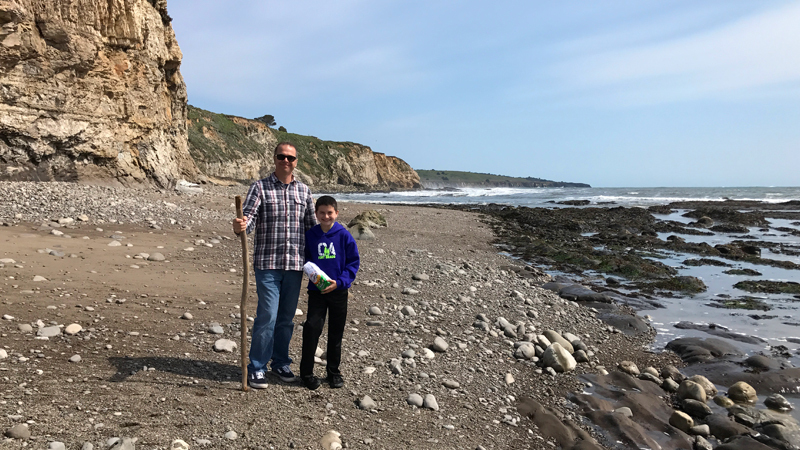 It includes a small parking lot, a rocky sand beach, and a scenic half-mile loop trail along the coastal bluff between Moat and Ross Creeks, which is also part of the California Coastal Trail.